Power Your Future - National TalentS Co.
science and initiatives powering Saudi Arabia today, and in the future. The exhibition was designed to be modular and able to reconfigure to suit a variety of different venues, from office reception spaces to major festivals and events. Energy efficiency was a particular content emphasis, with messages structured to inspire every visitor to rethink their everyday energy use. stories and subject matter of their choosing, and at their chosen depth. 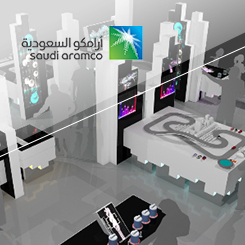 Client: Saudi Aramco: Power Systems Department.